Nearly two years after the Erskine Fire burned nearly 48,000 acres near Lake Isabella, communities scorched by the blaze are still rebuilding. Nearly two years after the Erskine Fire burned nearly 48,000 acres near Lake Isabella, communities scorched by the blaze are still rebuilding. When a Bakersfield church found out people were still in need they started organizing volunteers. Phil Green and his wife Sandra moved from between Bishop and Mammoth Lakes to Weldon to retire. Phil Green was a contractor and was planning on building one final home, his own. Green said, "Measure twice cut once. Sometimes I measure three times"
Green described his future home as, "It's a ranch style. It's going to be, we kind of like the Santa Fe style, so it's going to have kind of a stucco Santa Fe style look." For the rest of the summer Riverlakes Church in Bakersfield plans to send teams of volunteers up to Weldon to help the Greens build their retirement home. Angelo Frazier is a paster at Riverlakes Church. He said, "When the community goes through difficult situations the community can come together. These are great opportunities to love your neighbor." Two years ago the Greens were further along with the construction of their home when diaster struck. 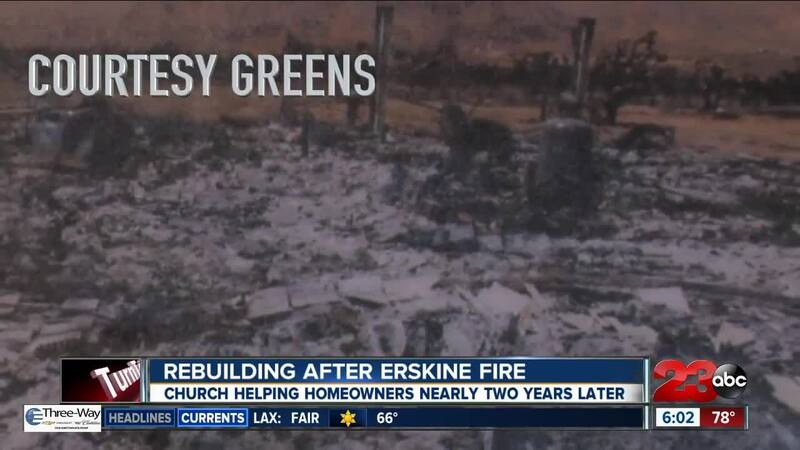 The Greens were getting ready to move into their home when the 2016 Erskine Fire raged through the Kelso Valley, destroying 309 building, including the Green's nearly finished home. "It wiped us out. Yeah, we're senior citizens, you know, we weren't expecting that. Thought we were going to have a nice little retirement. And so yeah, for the first year we were wiped out," said Green. Two years after the Erskine Fire the Greens are still trying to rebuild their retirement home. Green said, "We had enough money for one house and not two." During the fire Pastor Frazier says his church volunteered to help the victims. After a year of searching his team finally found the Greens. "Out in the middle of nowhere building, by himself. Having his wife trying to put in heavy windows, that's what we heard about. And we go no. We got to get up here and help," said Green. The result, Riverlakes Church has teams of volunteers giving in any way they can. And it's that giving spirit that's allowed the greens to rebuild out of their ashes and use the volunteers' generosity as the foundation of their forever home. "It restored our faith in human beings. And that people really do help," said Green. The Green's hope to have their house finished this summer so they can move in before the end of the year. But when the Green's house is finished, the volunteers say their work isn't done. They're going to move down the street to help other neighbors that were affected by the Erskine Fire.